Here's another children involving game just recently released into the hidden object/adventure genre. This time you are to set free the children trapped in a warlock's world. Redemption Cemetery: Children's Plight is a nicely looking and working gameplay wise game. Proceeding through the game you learn more and more details about the evil warlock and are able to find the way out. Usually cementeries seem to be very pieceful and quiet places to visit, and there is nothing to fear there normally. But that is not the case in Redemption Cemetery: Children's Plight. You get trapped by a warlock in a cementery in another world. But getting out of there is not the only goal that you have now. You are also responsible for setting free many children that are trapped. Proceeding through the game you learn more and more details about the evil warlock and are able to find the way out. As to the game's production values, they are top rank. 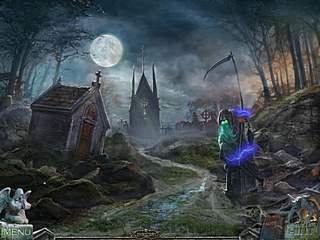 The graphics are beautifully detailed and eerie; the hidden object scenes and puzzles are well thought through. The animated items integrated into the game together withe the appropriate music and noises made it even more enjoyable. Most of the puzzles were not new but they were designed in a very unique way. The game is more liniar as you go through the scenes resquing chidren one by one. The game doesn't seem to be very challenging (maybe for the less experienced gamers in this genre). You get the clues that are followed by the items required to accomplish whatever is need. 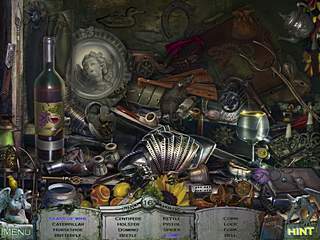 The hints in the hidden object searches recharge quickly, and if you are stuck, the game will tell you that there is nothing to do there or will highlight the unfinished area. The collector's edition features such extras as downloadable music and soundtrack, wallpaper, and concept art. All in all the game is very good in its every aspect to please the gurus of the genre. Touhcodwn! That's a really cool way of putting it! This is Redemption Cemetery: Children's Plight review. Download this game here.